Description: 18N heads over the East Road grade crossing just east of the interlocking at Prescott. 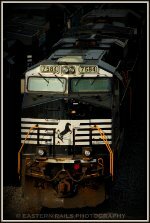 Description: Norfolk Southern ES40DC 7584 leads PRX1 (Princeton Ky. to Louisville Ky. empty coal) through Cecilia on a gloomy afternoon. NS 8376 and NS 7706 are trailing. Description: Heading east with a trailer train. Description: 7584 leads an eastbound past a group of fans.